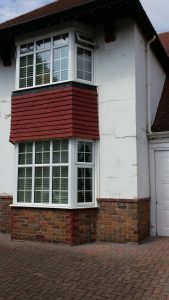 The Coastal Wall Ties team are highly skilled cavity wall tie replacement specialists based near Worthing, West Sussex and covering all areas of Sussex and Hampshire. We have over 20 years’ experience in wall tie replacement, backed by established and accredited professional bodies including the Guild of Master Craftsmen and Which? Trusted Traders. Our customers can be confident of superior levels of service from first contact through to completion of the work and after care. Cavity wall ties are crucial in maintaining the stability of any property built with cavity walls. The inner and outer walls are connected to each other using cavity wall ties which provide this essential stability. The wall ties also allow for the expansion and contraction which naturally takes place in any structure due to variable weather conditions. Older properties were generally built using mild steel ties which are prone to corrosion over time, so age is a common factor in cavity wall tie failure. A report by the Property Care Association1 in 2016 notes that “in some instances mild steel wall ties have corroded within 20 years of construction”. Some properties may not have had sufficient numbers of ties used when the property was built, or they may have been incorrectly spaced. Coastal properties are especially vulnerable to wall tie failure due to the salty air and onshore winds, which hasten corrosion, shortening the life of the wall tie. Today’s wall ties are better equipped to deal with these conditions and at Coastal Wall Ties we use ties made from marine grade stainless steel, covered by a 25-year guarantee. As mild steel wall ties corrode, they gradually force apart the bricks above and below the bed joints in which the cavity wall ties are laid. Key signs of wall tie failure include patterns of vertical or horizontal cracks in the mortar between the bricks, bulging of the exterior wall, cracks around window reveals and sagging lintels. Wall tie failure will affect the stability of the property, so an expert survey and diagnosis is essential to avoid further damage and potential wall collapse. 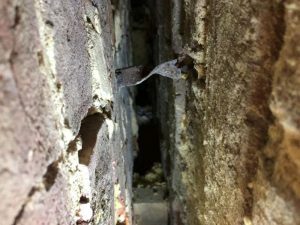 To determine the cause of any of these signs of wall tie failure — and the extent of the problem — we will undertake a comprehensive inspection and survey using a number of methods to offer every customer an in-depth cavity wall tie report. 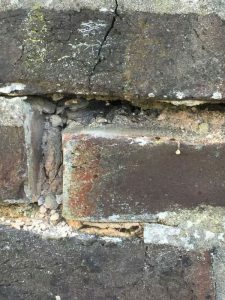 An initial visual inspection of the property will reveal whether it’s of cavity wall or solid construction and will determine the level of cracks in the mortar. A property of solid construction will benefit from inspection to identify the underlying cause of mortar cracking. The walls may also be scanned to determine the density and position of the cavity wall ties. If cavity wall insulation has not been installed, examination by boroscope will lend valuable analysis to the root cause and scale of the problem. If cavity wall insulation is present, wall ties can be exposed at high and low levels on the building by removing the mortar surrounding selected wall ties to check the extent of corrosion and rust. This enables an accurate assessment of the problem and potential repair. Video reports are also available, at an extra cost. All cavity wall tie surveys (and replacement work) are carried out externally and with minimal disruption. Our expert team will ensure that all mortar repairs are matched to the existing mortar for a consistent and blended finish. A property in West Sussex with wall tie failure prior to wall tie replacement. 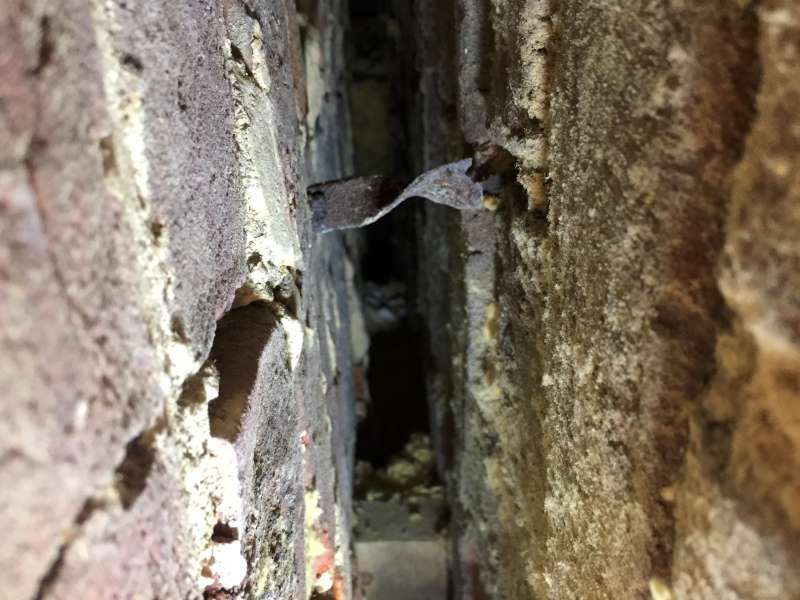 As experienced cavity wall tie replacement specialists we undertake a comprehensive inspection and survey to determine the type of remedial tie to be used, depending on the type of property. Some different types of wall tie include: Drive ties, used for celcon blocks, clay bricks, concrete blocks or timber studs. Resin to Resin wall ties are most suited to masonry where the quality of the fixing is unclear. Double mechanical ties with neoprene expanders are 304 grade pre-torqued stainless-steel wall ties. Designed to provide a fast and reliable fixing, these ties only allow the outer part of the tie to expand once the inner wall has fixed in place. 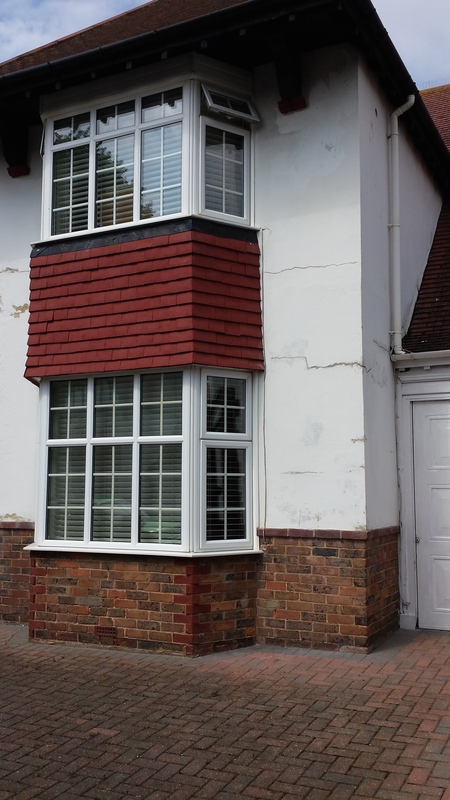 Once the remedial cavity wall tie replacement has been completed, our highly-skilled team will match brick colours and pointing mortar to the existing shades, ensuring that every property is completely restored to a professional finish. Cavity wall tie failure is a serious structural problem. Contact us for a professional survey with a free no-obligation report and quotation. You can reach Coastal Wall Ties on 01903 713053/07513 345231; email us at: enquiries@coastalwallties.co.uk or send an online enquiry. You can be assured of our expert, affordable and attentive advice, backed by a 25-year company guarantee. An insurance backed guarantee is also available.